oh. my. god. Did you make this up? Where did you find this? I must have some. But why does it taste like remorse? ….and Harry? Oh my god. This ice cream needs to exist IMMEDIATELY!! I would buy out the store. Plus it looks yummy, too! What about Ben & Jerry’s Chocolate Salty Balls? I really, really hope that is real!!! It’s not real ……. yet. It was designed by illustrator/graphic designer Jon Defreest. Hopefully B&J’s will see how popular the idea is and jump all over it! Oh…oh…I don’t even watch the show and I WANT SOME!!!!!!! So sorry, but it is a joke. I search Teh Internet. My heart breaks a little more. Well it’s decided. Dinner tonight will be Miami Slice with a side of Schweddy Balls. dear gawd, this sounds good! Hahaha at least he puts in both white AND dark chocolate body parts! I don’t watch the show – but that is awesome! So what’s the verdict? Is this flavor for real? That is just awesome. Body parts… Cool. Schweddy Balls are on my list first, though. Is Schweddy Balls a joke then, too? I read about that new flavor somewhere on the interwebz this week…. 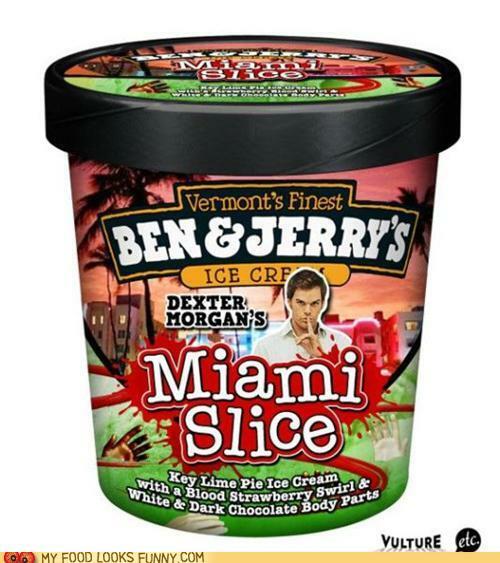 I do love me some Dexter and this would be so awesome if it was real! I can’t wait for the premiere! That actually sounds awesome. A little creepy, but awesome. Oh my! Looks unbelievably delicious. I think the Schweddy Balls is for real though. Man, I think there obviously needs to be a whole serial killer ice cream series. I mean, Hannibal was before Dexter, where’s the love? I want this. Where did you find this? Make it come true dammit! I would completely buy it.